On the grid we see Pertti Kuismanen and Markus Palttala, still in contention for overall GT1 honours in the FFSA GT Championship. The start was quite eventful. 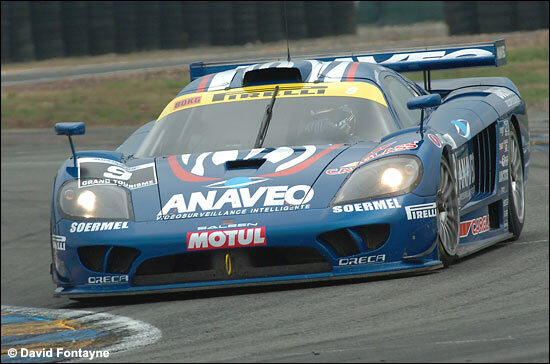 Cyril Helias (#5 First Racing Viper) came from the second row and was first into the Dunlop complex, ahead of Guino Kenis (#26 SRT Corvette C5-R), Bruno Hernandez's #9 Oreca Saleen and Patrick Bornhauser's #1 VBM Viper. In the Dunlop chicane however there was a moment when the four leaders crossed the gravel trap - followed by almost the whole field! Helias came out first, ahead of Kenis, Hernandez, Bornhauser and Police (#10 Mirabeau Viper). 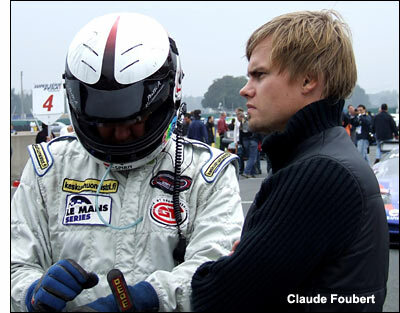 Pertti Kuismanen was the main loser: from sixth on the grid he was in eleventh place at the end of lap 1. This is the scene as they headed into the Dunlop Curve at the start. Helias and Kenis demonstrated impressive pace and widened a gap over Hernandez, Bornhauser and Police being a bit further back. 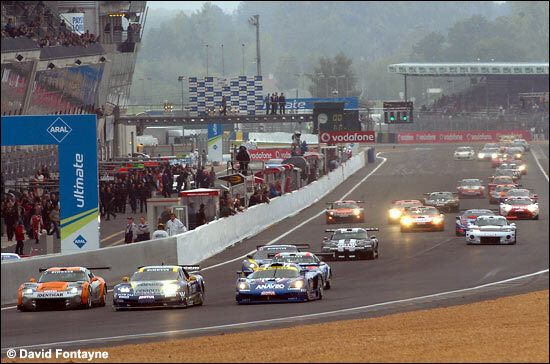 Behind them, the fight was rife between six drivers: Dubreuil (#23 CD Sport Viper), Balthazard (#2 Larbre Ferari 550), Blanchemain (#24 PSI Corvette C5-R), Debard (#14Tarrès Team Viper), Dupard (#7 Larbre Ferrari 550) and Kuismanen (#25 PSI Corvette C6.R). Kenis took advantage of traffic to pass Helias in the Chapel Curve (lap 11), so Helias was second ahead of Hernandez, Bornhauser, Police, Balthazard, Debard, Kuismanen, Blanchemain and Dupard. Dubreuil in #23 Viper had dropped out with mechanical problems. Hernandez pitted first, followed by most of the other drivers. However Cyril Helias waited for the later stages of the pit window, as did Narac (#36 IMSA Porsche), the GT2 Trophy leader. Soheil Ayari took over from Hernandez and set a very fast pace, out in the lead after all the driver changes. He kept this pace until the chequered flag and claimed his sixth win in the season, as simple as that. Behind the Oreca Saleen, Eric Cayrolle (#26 SRT Corvette) was a quiet second, but Thévenin (#1 VBM Viper) who was in third place was threatened by the fightbacks of Palttala (#25 PSI Corvette C6.R) and Makowiecki (#10 Mirabeau Viper). 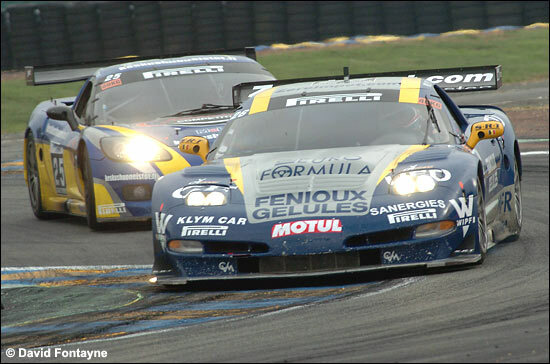 Eventually both men succeeded in passing the 2005 champion. Palttala tried to come upon Cayrolle, but it was too late. Ayari and Hernandez now have an 81 points lead on Palttala and Kuismanen - but cannot quite claim the title. Soheil Ayari: “I believe that we made a big difference in the pits today, while strictly observing the pitstop timing of course, and we gained a few seconds. I came back on the track close to the Corvette and I could pass it quickly. Tomorrow, we won't be necessarily too careful because with this team, we always want to win the races, so why should we stop now?" Guino Kenis: “Tis morning during the qualifying session, the car was uneasy to drive when the tyres were not on temperature, so I was puzzled at the start. During the formation laps I took care to warm them up. The start was eventful, but it was interesting, I love these kinds of races. Then I was quicker than Cyril Helias's Viper, he made some tiny mistakes and his tyres were worn out, so I waited for the right time to overtake him. I am really pleased with this first race in the FFSA GT Championship!" Eric Cayrolle: “We lost some time in the pits, and we had a strategy which was a bit different. The Saleen pitted one lap before us and they took advantage of it. I had just to finish the race, my partner made the whole job today. However it was just time for the end of the race, because I had some problems, braking problems. We earned our position during the first stint, we must congratulate Guino for his first race at Le Mans. I hadn't been on the podium in the FFSA GT Championship since Dijon, in 2004. I began to miss it. We have three races left, we'll try to go on. At Magny-Cours, I'll partner again with Thierry Soave and I hope that we'll be on the podium together. We are waiting for it since we are partners but it still doesn't come, and I hope that we'll make it at Magny-Cours." With thanks to Frédéric Espinos, with images by David Fontayne.